Editable royalty-free map of Denmark in vector-graphic online store. 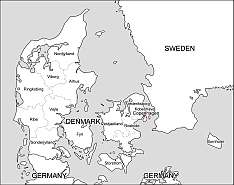 THE LONG, NARROW Jutland Peninsula that makes up mainland Denmark extends from Germany toward Norway and Sweden. To the east of the peninsula more than a hundred islands make up the rest of the country. 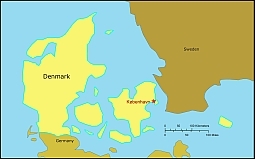 Denmark is the most southerly country in Scandinavia and is one of the flattest lands in the world. Like its neighbors, it enjoys political stability and a high standard of living. Industry has developed rapidly, and today a third of the people work in small factories.